Grilled Lemon Herb Mediterranean Chicken Salad with a dressing that doubles as a marinade! 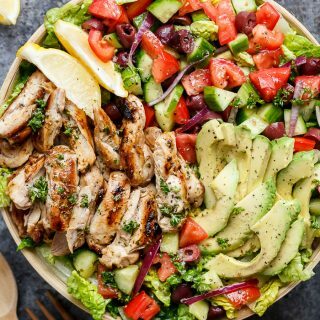 This Grilled Lemon Herb Mediterranean Chicken Salad recipe is as close to perfect as you can get! 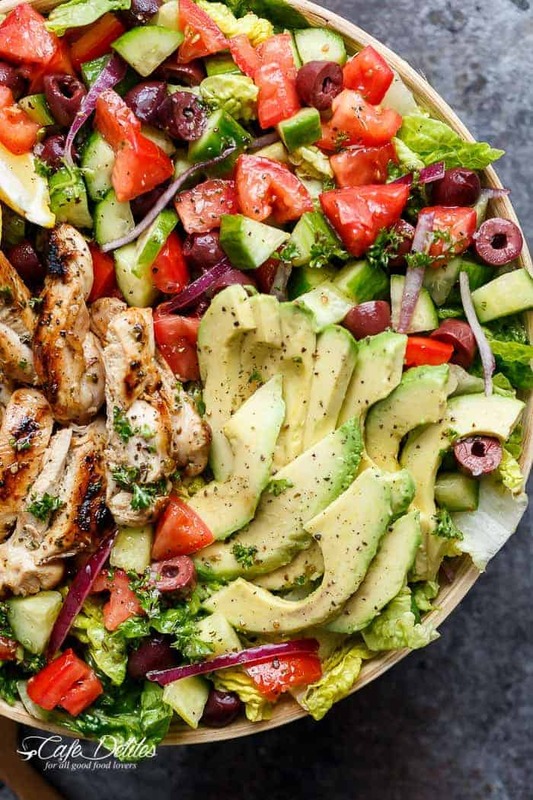 Full of Mediterranean flavours: olives, tomatoes, cucumber, avocados, and chicken for a complete meal in a salad bowl! With all of the salads I post on here, I thought some might be getting sick of these meal in salads recipes. BUT. It turns out, you guys are wanting MORE of these GIANT salads. Wracking my brains for another awesome recipe, what’s better than a fresh, mediterranean salad with so much flavour, you won’t be able to put your forks down? Yes, I sound like an infomercial. No, I don’t care. As usual, I always try to create salad recipes that you only need ONE dressing / marinade. A salad that uses one thing for two uses. This comes from years of making salads that require completely different marinades for chicken or the meat of choice, then drowning it in a completely different tasting dressing, only confusing my brain and taste buds even more. Why do that when you can create one delicious marinade and use it as a dressing? That kinds makes more sense. You can ALSO top it with some crumbled feta or goats cheese, which I didn’t have at the time, BUT it’s included in the recipe as an option for you to enjoy! Add 1/2 cup crumbled feta to give the salad an even better flavour! Excelente!!! Thank you, thank you for sharing, my whole family loved it! Excellent salad! Loved the chicken marinade!! Absolutely delicious!! Added this to our weekly meal rotation we love it so much! We’re dressing hogs so I always double the dressing/marinade and put the extra in a container to keep throughout the next few days. Made this last night and my wife and I enjoyed every bite. I made a couple of minor changes though. Firstly, I substituted avocado oil for the olive oil and mixed in a couple of tbl of mayo as I felt the dressing was a little too acidic. Will definitely make this again. Hello, do you have any suggestions for how to store this salad for Meal Prep? This is such a delishous and tasty salad! Tastes just like Greek chicken salad from the Coney Island restaurant but even better! Making the salad ahead of time is very helpful. Great recipe & So simple and delicious! My kids said “This is better than a Panera salad!” Sometimes I just marinade the chicken and grill it and skip the salad – both delicious! I absolutely loved this salad!!! You can change up the meat. Double up the dressing/marinade! Only made the chicken, not the salad, but it was absolutely delicious. We tried this salad last night and oh my goodness! It was so easy and had so much flavor. We were completely satisfied afterwards. I’ve been looking around on your website and noticed that we have already pinned quite a few of your recipes, I’m so excited to try more. Thank you! That is great to hear! I am so glad that you have already had some of my recipes pinned! Thank you so much for sharing and following along with me! Absolutely delicious! I substituted balsamic for lemon juice for the dressing because I ran out, left out the olives, and cooked the chicken on the stovetop in cast iron skillet on high because we don’t have a grill. Chicken was perfectly seasoned. 5/5 would make again. Thanks for sharing. Love, love, love this salad! The dressing/marinade on the chicken is delicious. My boyfriend loves it so much that he wants to eat it every other day, so I said okay, no problem. Just so we won’t get tired of it I’m going to try it with grilled tuna one day, another day with grilled steak, another with salmon. Just to change it a bit, since we’re goin to eat it very often. Also I changed a few of the toppings by adding quinoa, mushrooms and broccoli. With that dressing can’t go wrong with what we add. Thank you so much for sharing your recipe. Fantastic! When I asked my family, elementary aged children included, what they would have me change…they just said “MORE”! Will be a staple at our house! Will be including this recipe in my “Inspiration Sunday” post tomorrow ! With the Freestyle on W.W. now using chicken breasts are feee. 2 Tbsp of EVOO = 8 points. The seasonings Do Not count on any W.W. Program. Other than the Avacado the rest of the salad ingredients do not count either. Correction, 6 XML olives or 4 large count 2 points. Eat away & enjoy. This is one of my favorite salads! Made it 3 times at least and now, will make it again!! Thank you for the great recipe. OMG, this salad looks A-M-A-Z-I-N-G! Our family lives (to varying degrees) low carb, high fat and we don’t come across as many salad options as I would prefer these days. I cannot wait to try this. When I first looked at the PIN, I thought for sure that you would callout using chicken breasts and was pleasantly surprised that you recommended chicken thighs as the first choice. I also assumed that I would have to swap out sugar for swerve (or other), but nope, you have it covered. Thanks so much for sharing this recipe. I’m sure we are going to enjoy this often! How does 2 TBS oil and those seasonings equal 36 gm of fat and all that sodium? 15 pts? Lovely and tasty recipe 🙂 Thanks for sharing !! This is a fabulous recipe – we love it! This salad dressing/marinade recipe is flat-out delicious! My husband is raving about it, too. I’ll be making it in quantity so I can have it on hand all of the time. Thank you! Gay you are very very welcome! Thanks you so much for sharing that with us! Delicious. 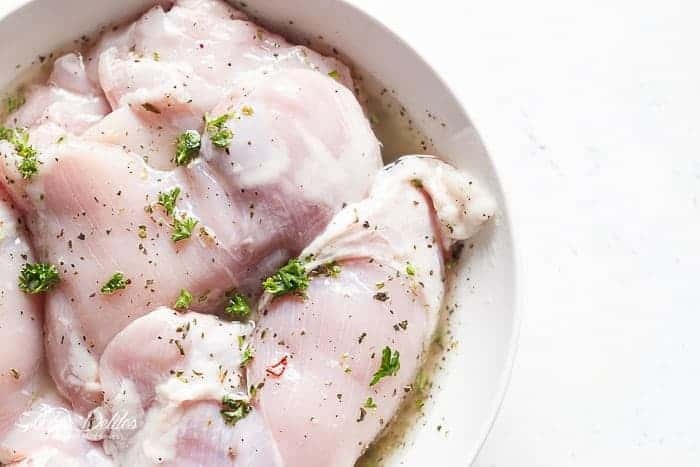 I’ve never tried chicken thighs before but they are a less expensive cut and they were perfect. I did double the dressing / marinade though and added the feta. Next time, think I’ll try this with shrimp. I made this for dinner tonight. Doubled the marinade based on comments. DELICIOUS! A new family favorite! This was such an easy and delicious meal, not to mention healthy! I will be making often. Thanks for sharing. So good! Made this two nights in a row. Delicious. Can’t wait to try other salad recipes now! I made this last night and it was a huge success! It was really flavorful and so great to have only one sauce: marinade and dressing! Thanks! What a great salad. I added cubed feta, grape tomatoes and forgot about the lemon wedges for garnish. Didn’t miss them. Hubby & I practically licked our plates this was so good. Very easy to put together too so makes a nice healthy weeknight meal. Hi! I didn’t read thru all of the responses, so please forgive me if this is a duplicate question – can you please take a look at the Smart Points? Seems to me it should really be a lot fewer than 15. More like half that, without the feta. Thanks! I want to make this for 6, Do I just add 2 breast and 1extra of everything else? Samdra I’d use the two extra breast with half extra dressing! I wouldn’t double the dressing as it may be too overpowering. Karina, thanks for sharing this recipe! I cannot wait to make it tomorrow, your salad looks pretty and delicious. I am so happy that you survived your ordeal with cancer and I am praying that you have a long wonderful and healthy life. Keep the recipes coming! lol I love healthy meals. Is the sodium really 770mg for 1 serving? There is only 1 teaspoon of salt in the marinade, and this recipe says it serves 4 people. I made this for dinner tonight and it is so delicious, taste like something from a restaurant. My kids even loved the chicken and they don’t like to venture much past chicken nuggets or corn dogs- I was amazed! I will definitely make it again. Thank you for the recipe! Can the marinadating the chicken be longer if I do it the night before or morning before work – would this work . Looking forward to trying this out – as we eat a lot of chicken – especially boneless skinless. This looks delicious. How far in advance can you make the dressing? Made it tonight, it was so flavorful. Didn’t really need the meat. This was FANTASTIC loved it !! .. very easy to make.. will make this again, will be even better in the summer to grill the chicken outside. Is it because of the avocado? Tried this yesterday and absolutely LOVED it!! !Thanks for a wonderful, yet easy to make recipe! I am on a Strict Keto diet and am adding this to my Keto friendly recipes. However, I will change the chicken breast to boneless skin-on thighs. I pre-plan my meals so this is going on next week’s menu. 10 Net carbs is a good meal choice. Hi Karina, this looks delish cant wait to make it. What else can i use instead of red wine vinegar? I am looking forward to making this salad. I am making my version of one serving, using 3 oz of chicken breast, 1/4 avocado, 5 olives, etc… I got it down to 7 WW smartpoints!! So super excited!! Thank you for creating! Yum! This salad sounds amazing. I can’t wait to try this recipe. I will be sharing a link to your recipe in my upcoming post, Easy Healthy Lunch Ideas (on a Budget). I am sure my readers will love your recipe too! This review is for the marinade and the chicken only. 5 stars! Not sure if it registered the 5 stars I rated. I didn’t see them showing. I just finished grilling the thighs after a 2 hour marinade. The only thing I changed was to use 2 teaspoons of dry parsley for the 2 Tablespoons of fresh. Wow! This is a keeper and will go on a regular rotation! The marinade really got into the meat with the 2 hour soak. I also blotted the thighs well to remove most, but not all, of the marinade. I made this last night for my husbands birthday!! Omg!! We loved it!! Came out perfect! Refreshing & oh so tasty! Thank you for sharing! ? We shared this recipe on Facebook as our “Recipe of the Week” this past week and everyone LOVED it! Thanks for publishing! Keep up the great work, Karina! This salad was AMAZING! Can’t wait to make it again,I would double the marinade. Five Stars… but it won’t let me! This looks lovely! I’m planning on making this on our camping trip but I was wondering, could I marinade the chicken and then freeze it? I’ve made two of your chicken salads for weekend dinners and weekday lunches! These are great recipes for changing it up and lightening it up! Thank you for the nutritional info on your recipes! Being an insulin dependent diabetic, that is such valuable info! Made this recipe tonight for supper, even the 15 year old liked it. Nice flavour and a nice combination of ingredients. Karina! You’ve outdone yourself with this recipe. 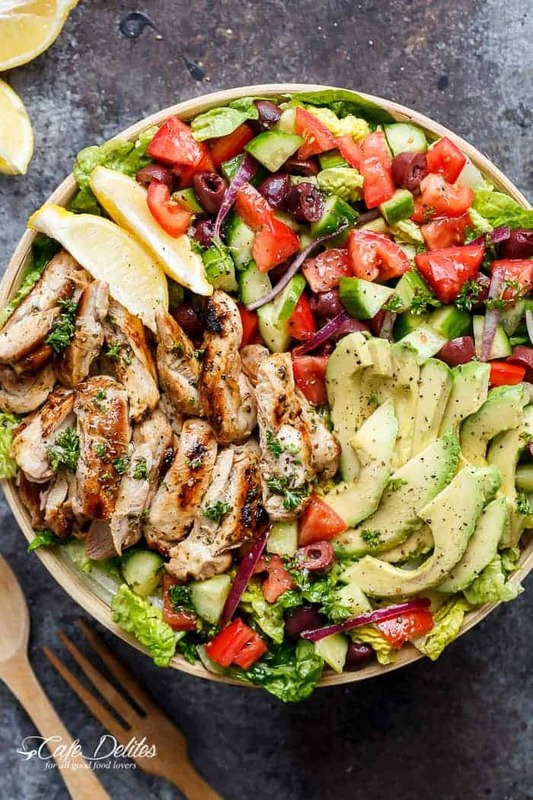 First of all, Greek salads are one of my favorites; Nicoise is my favorite, and second, I am a professional cook and live for food in all it’s glory, provided it’s healthy and beautifully presented. I am off to the store to collect all of my ingredients for tonight’s dinner. One exception is that I have leftover roast pig from a 4th of July barbecue (no sauce on it; just pure pork meat) and I’m substituting that for the chicken in your recipe. I also have crisped pork skin that I’m laying on top as a garnish and good eating. Take care and I’m so glad you’re here to share with me.